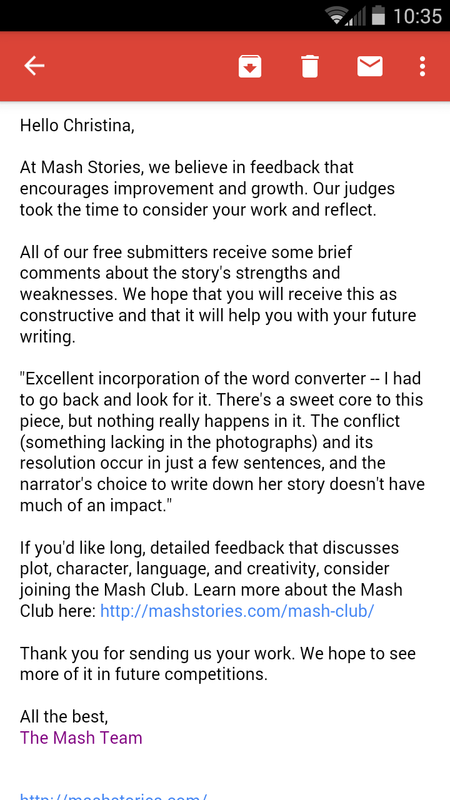 This entry was tagged Feedback, Mash Stories. Bookmark the permalink. That’s fantastic! I’m impressed that they have time to do it to be honest. I worked on my school’s literary magazine throughout college and simply reading submissions takes a while. To give everyone we rejected feedback would have taken way more time than we had. I’ll definitely be reading up on them to see what kind of writing they take. Feedback is just so valuable, especially when it’s coming from someone who knows what they’re talking about. Yes. Even though my submission did not get accepted, I was very happy to receive some feedback! I have a feeling I will be submitting more stories to them in the future.